Split Rings There are 11 products. Apple shaped key ring/split ring. Great for lanyards, key fobs and more. Dimensions are approximately 1-1/4" x 1-1/8". Steel key ring/split ring. Great for lanyards, key fobs and more. Star shaped key ring/split ring. Great for lanyards, key fobs and more. Dimensions are approximately 1-1/4"
Mickey mouse shaped key ring/split ring. Great for lanyards, key fobs and more. Dimensions are approximately 1-1/2" x 1-1/4". Oval shaped key ring/split ring. Great for lanyards, key fobs and more. 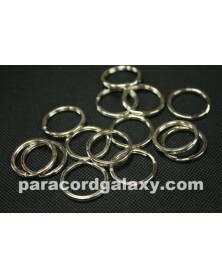 Dimensions are approximately 1-3/8" x 1-1/8". 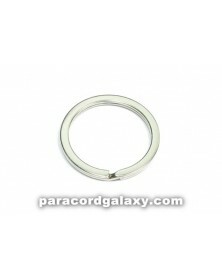 Nickel plated steel key ring/split ring. Great for lanyards, key fobs and more. Pull Apart Key Ring for Paracord. Pull apart key rings lock together securely but are easy to seperate when needed. Perfect of paracord lanyards, key fobs, leashes and collars for small dogs and more including camping, 72 hour kits/bug out bags and household use. Overall length is 3". 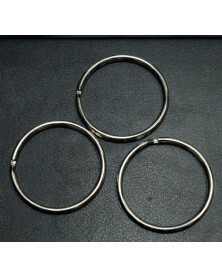 Split rings are 1" in diameter. 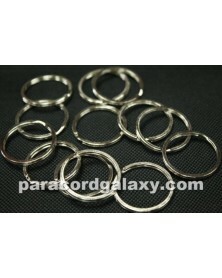 Round shaped key ring/split ring. Great for lanyards, key fobs and more. Dimensions are approximately 1-1/4". Heart shaped key ring/split ring. Great for lanyards, key fobs and more. Dimensions are approximately 1-1/4" x 1-1/4".